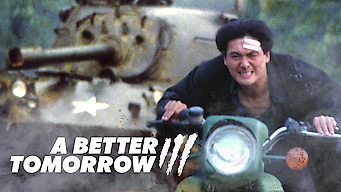 How to watch A Better Tomorrow III (1989) on Netflix Taiwan! Yes, A Better Tomorrow III is now available on Taiwanese Netflix. It arrived for online streaming on December 28, 2018. We'll keep checking Netflix Taiwan for A Better Tomorrow III, and this page will be updated with any changes. In this prequel, Mark Gor travels to war-torn Vietnam to get his uncle and ex-con cousin to Hong Kong before the communist takeover and finds love. In the final chaotic days of a brutal war, an iconic antihero is reborn -- and discovers the love of his life.